David Skorton, ‘74 MD, secretary of the Smithsonian Institution, will give the keynote address at Feinberg’s convocation on Monday, May 21. 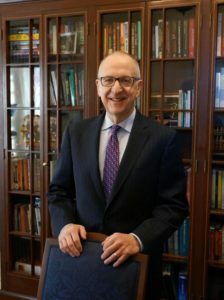 David Skorton, ‘74 MD, secretary of the Smithsonian Institution, will address graduates and guests at Northwestern University Feinberg School of Medicine’s convocation on Monday, May 21. The first physician to lead the Smithsonian, Skorton oversees the world’s largest museum and research complex including 19 museums and galleries, 21 libraries, the National Zoo and numerous research centers. A cardiologist, his research has focused on congenital heart disease and cardiac imaging and image processing. Before starting his position at the Smithsonian in 2015, Skorton was the president of Cornell University and a professor in the Departments of Medicine and Pediatrics at Weill Cornell Medical College in New York City and in Cornell’s Department of Biomedical Engineering at the College of Engineering. Prior to Cornell, Skorton was president of the University of Iowa. He received his bachelor’s degree in psychology and his medical degree from Northwestern University. He completed his residency and fellowship in cardiology at the University of California, Los Angeles. In 2009, Skorton received a Northwestern Distinguished Alumnus Award. Skorton is a master of the American College of Cardiology, a member of the National Academy of Medicine and a fellow of the American Academy of the Arts and Sciences.